Figure 18.3. Shank Synaptic Targeting Regulation by Homer Proteins. Shank targeting and PSD structure are regulated by competitive Shank and Homer interactions: Shank and the constitutively expressed Homer1b protein increase dendritic spine size, whereas the activity-dependent expression of Homer1a reduces Shank localization to the spine and reduces the size of the spine and PSD. from this complex induces the degradation of Shank and GKAP79. 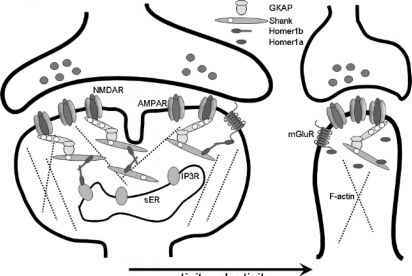 Synaptic activity can also induce the ubiquitination and degradation of Shank and GKAP57. The synaptic targeting of Shank2 and Shank3 seems instead to depend on their C-terminal, and not on their interaction with GKAP in the PDZ domain80. The function of GKAP family of proteins is less characterized. The four members of the family were originally identified as proteins interacting with the GK domain of PSD-95. GKAP has five repeats of 14 amino acids involved in the interaction of PSD-95, and binds to S-SCAM, nArgBP2, Dynein light chain, and Shank, and may therefore function as a scaffolding protein that link PSD protein complexes to motor proteins81. 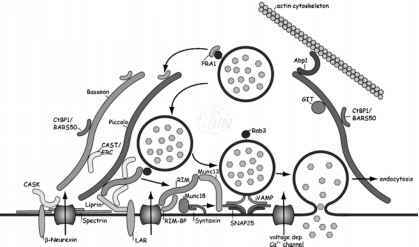 Other important Shank partners are proteins that regulate dendritic morphology and formation, such as Dasm182 and Densin-18083, whose activities also seem to be regulated by Shank. Finally, Shank proteins can potentially be produced locally due to the presence of its mRNA in the dendrites84.